The remaining work should be done in a clean area. You'll need to pull the front panel off the unit. 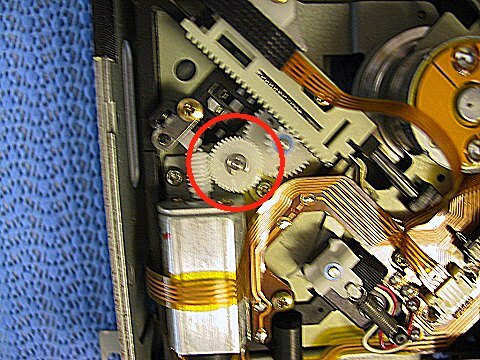 Make sure the power knob has been removed (a flat-bladed screwdriver with some tape on the blade works fine). 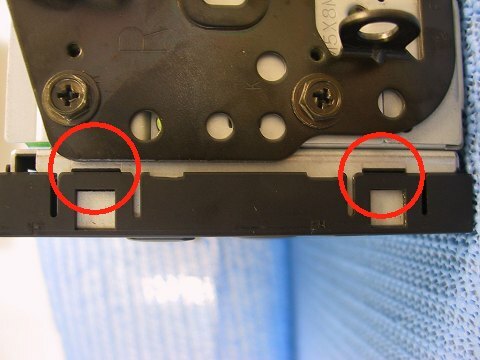 The following series of photos shows the clips/snaps that retain the faceplate to the cage. 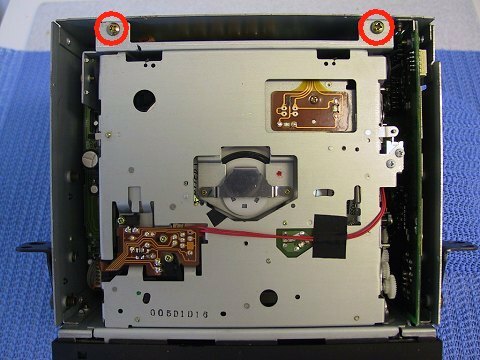 Simply pulling the CD player out of the cage stresses the circuit board, and risks breaking it. 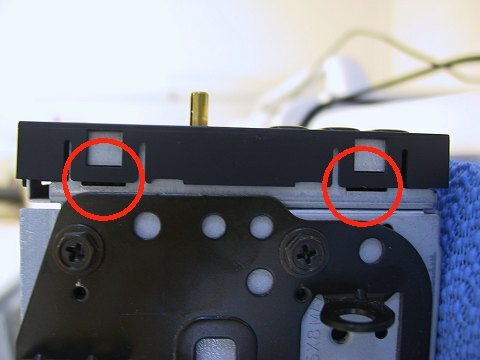 Even so, there is little room to work, so I had to hammer the sides of the tool to make it narrow enough to slip down in to reach the connector. 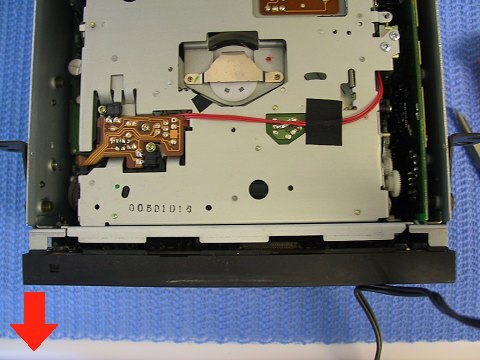 I then applied upward pressure as I pulled the CD player out of the cage. 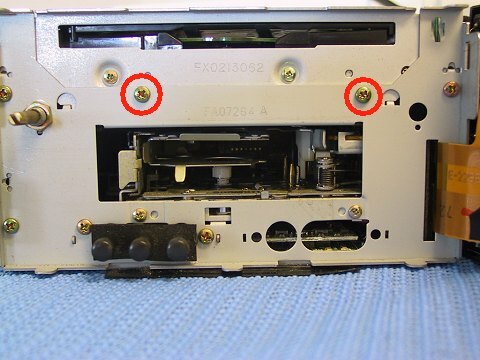 It took a while, but I did persuade the connector to come apart without breaking anything. 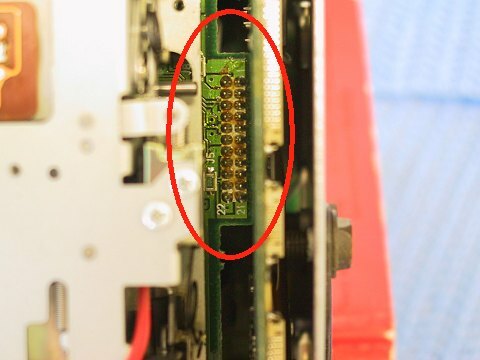 OK, with the screws removed, there's a fragile flex connector that needs to be disconnected. 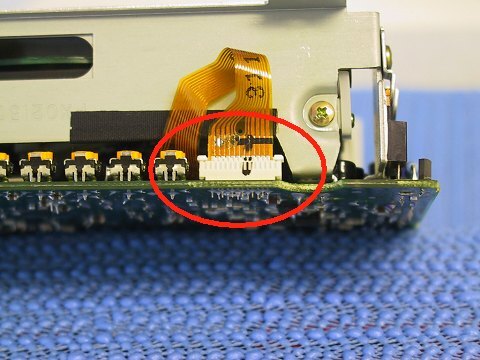 If you've never encountered this type of connecter, the flat Mylar "cable" has some tinned connections that are inserted into the plastic socket on the circuit board. 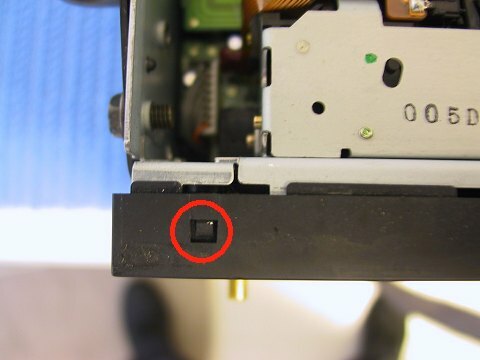 A plastic lock then snaps the cable into the socket. You'll need to gently (that's the byword for this whole procedure) pry up the ears on the locking clip, then remove the cable from the socket. It's actually simpler to do than to explain, but exercise care as you go. 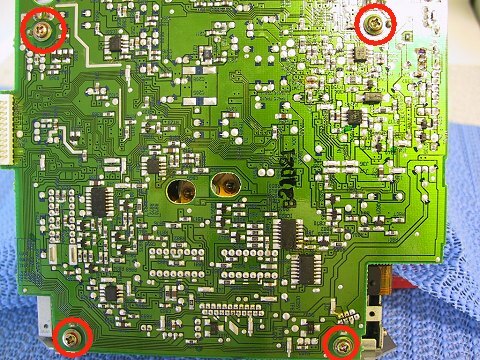 You can remove the remaining connectors or, as I did, leave them intact and make sure the circuit board is properly supported to avoid placing stress on the connectors. It's up to you. OK, I apologize for the fuzziness in this next photo (that's what happens when you think you've mastered the camera), but I'm NOT opening this back up to re-shoot it! 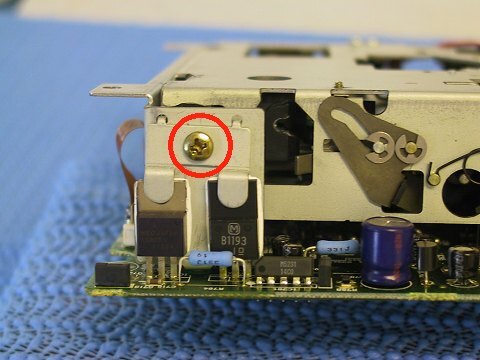 This small drive gear needs to be removed. 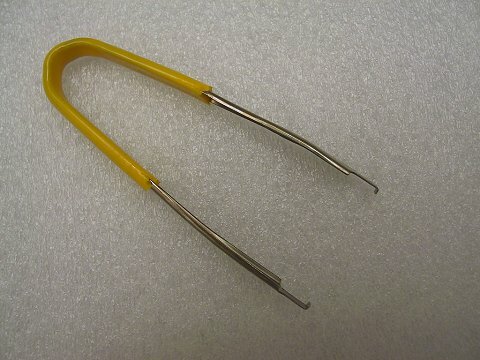 There is a small E-clip on the shaft that you can ease off with a small screwdriver. Don't lose it! Once you've removed the gear, put it aside. OK, all of the previous work was merely to get to the innards, and here's where your hard work pays off. Just be patient and clean all the crud off. Don't forget to clean the gear you removed! Once everything is cleaned, use a Q-Tip and some very light household oil to lubricate the shafts and also the gears. Apply SPARINGLY! 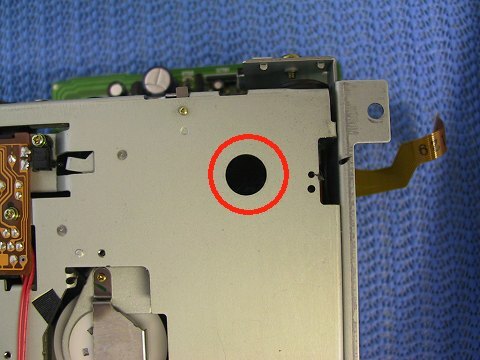 OK, there's not much to see in this photo, but inside that hole you'll see the tiny glass lens of the CD reader. 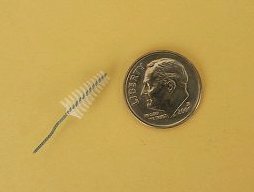 Using a steady hand, gently wipe the lens clean with a Q-Tip and a small amount of 91% alcohol. I'm sure there are some professional tools to do this, but I'm not a professional, so this is what I used. Guess what? That's IT! Well, there's the matter of putting everything back together, but you can follow the photos for that. 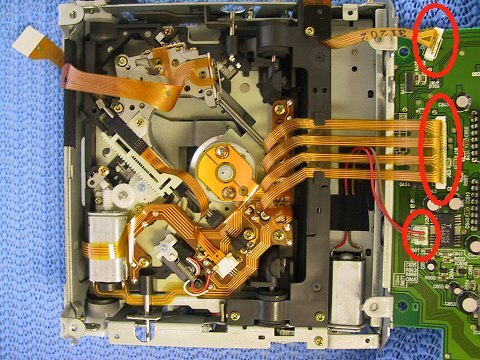 If you listen to cassette tapes in your car, this is also a fine opportunity to clean the tape pathway in the cassette player. 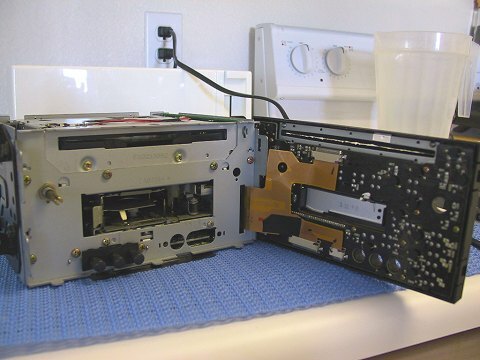 I don't use cassettes, but I got in there and cleaned anyway (it was FILTHY). It's like replacing everything you can when you get the engine out of your MR2 -- the last thing you want to do is pull that engine again! I'd like to once again thank Pete Hartwell for contributing the procedure.